We rely on this on Friday nights in the fall and winter when we need to clear out the refridgerator before our trip to the market on Saturday morning. It’s not really a recipe – more of a “Choose Your Own Adventure” – so feel free to play around with the quantities if you have more or less of something. Roast the vegetables, if you need to. (Follow these instructions.) 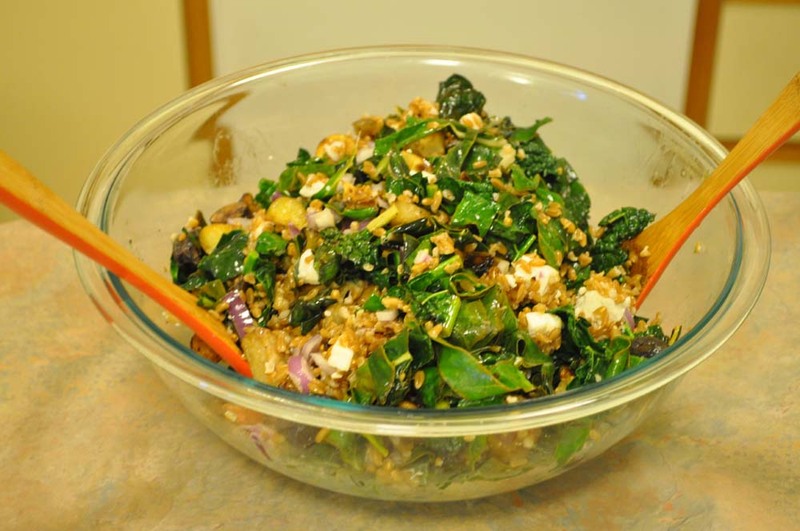 Start cooking the grain while the vegetables are in the oven. Cook the grain: Bring the water to a boil. Add the grain and 1/4 teaspoon salt and cook (covered) at a simmer for the noted time or until al dente. Taste frequently, because you want slightly chewy, separate grains for this, not soft, mushy ones. Once the grain is cooking, move onto the next step. 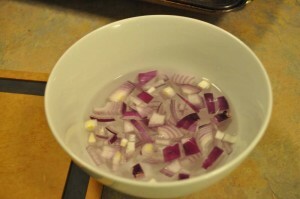 Chop the red onion and soak it in cold water for about 30 minutes. This will remove some of the “sting” and make it milder. If the greens are fresh, separate the stems from the leaves and chop each into bite-sized pieces. Heat 2 teaspoons of the olive oil in a pan. Add the stems and saute until they begin to soften (about 5 minutes). Add the greens one handful at at time, waiting for them to wilt slightly before adding another handful, so that you can fit them all in your pan. 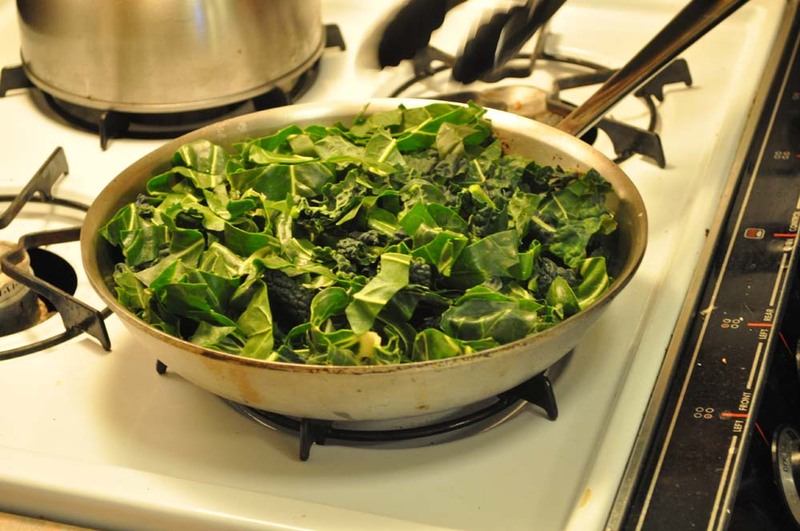 Once all the leaves are in the pan, add 2 tablespoons of lemon juice and a pinch of salt. Cover and allow to cook for 3-5 minutes or until bright green. If your pan doesn’t have a lid, use a pizza pan (like we do) or tin foil. Taste the grain to see if it’s done. 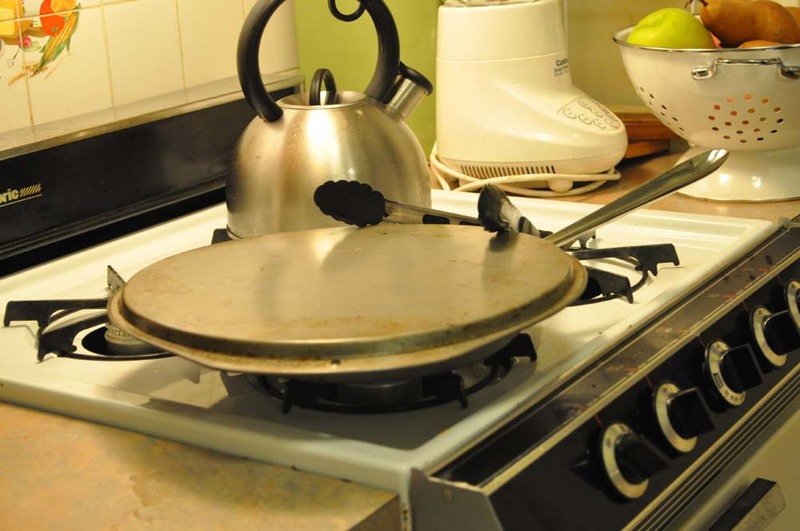 Once it is, drain off any extra water and cover the pot until everything else is ready. To make the dressing, add 2 tablespoons of lemon juice to the bottom of a large salad bowl. Slowly whisk in 2 tablespoons of olive oil. 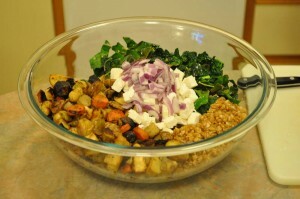 Add the grain, roasted vegetables, red onion (drained), greens, and feta to the bowl and mix well. This time, we used farro, roasted celeriac, carrots, sunchokes, kohrabi, and potatoes, Swiss chard and kale, and feta. Feel free to use your imagination and leftovers!